Eurovudas Wales Log Cabin: The Eurovudas Wales Log Cabin is available in seven sizes according to your preference and needs. The cabin has large double windowed double doors, a double window in the side, and either a single or double window in the front (depending on the cabin size), to let in plenty of natural light and give the interior an airy and spacious feel. The 19mm tongue and groove roof comes with the optional additions of roofing felt and bitumen shingles, and overhangs the front of the cabin to provide shelter and shade. The wall logs are 34mm thick, and have interlocking double tongues and grooves to provide great protection against ingress from wind and weather. 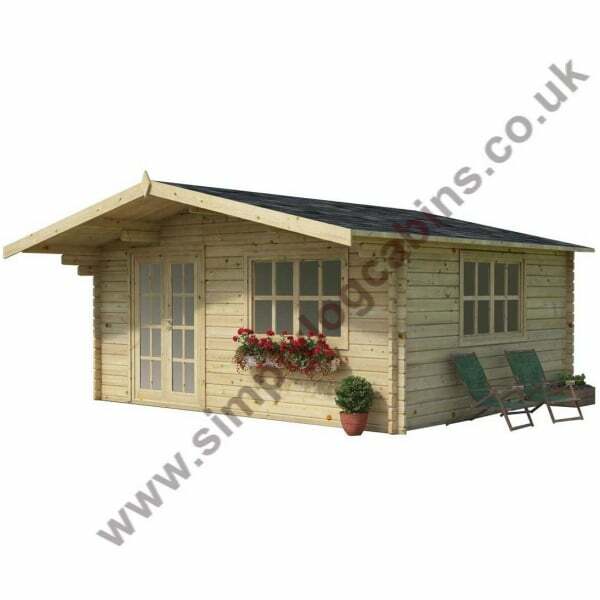 A versatile and classically styled cabin, the Wales offers lots of functionality in a highly attractive garden building.